The fundamental technology at the core of any MPS system is Radio Frequency (RF) to Fiber Optic (FO) conversion. 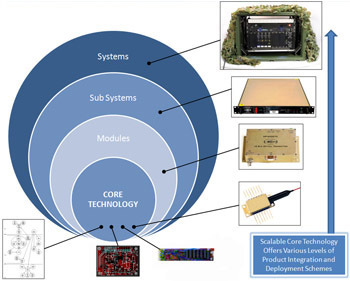 This technology, coupled with expert capabilities in advanced circuit design, mixed format signal integration, and embedded microprocessor control allows MPS to design, manufacture and deploy the sophisticated RF Photonic components, subsystems and systems. Advanced test and measurement lab facilities, equipped with Lab-View embedded RF and Optical test capabilities. Methodical systems engineering approach for executing site surveys and conducting coverage testing. In-House ability to design, fabricate, test, and install military grade FO and RF co-axial cable assemblies. Capable of executing precision splicing and termination of complex fiber optic components, patch panels and optical harnesses both in-house and in the field. Extensive manufacturing experience and relationships with contract manufacturing activities. Established manufacturing and test procedures of RF/Optical systems within ISO 9001 quality guidelines.